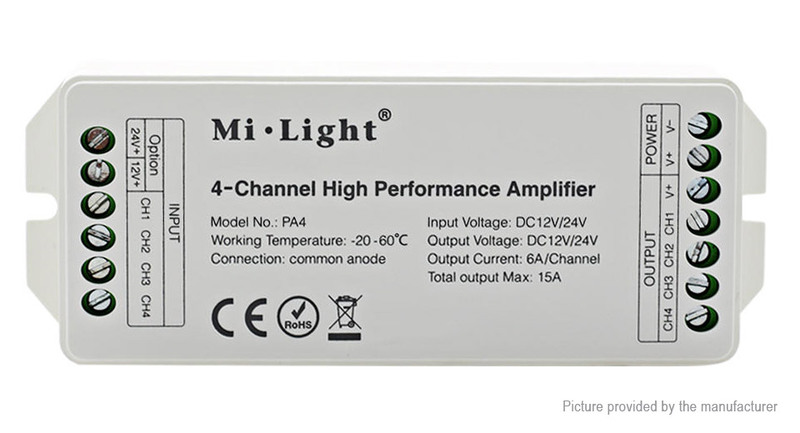 PA4 is a newly updated high performance 4-channel signal amplifier. Adopt high speed optical coupler with 10Mbps output rate, it can output the signal of mai controller completely and synchronously. This products work on all PWM series Led controllers in market. Made from the big current MOSFET to assure the high rate output. Every time you add one more amplifier, you can connect twice as many as Leds. Theoretically, it can connect countless amplifier, input and output is with optoelectronic isolation. Working with main controller can satisfy the application requiring large power, wide range and synchronization area. Led strip must be DC12V or 24V and the output and input must be the same. Please check whether the input voltage of the constant voltage power supply is accordance with the controller and please check the connection of both the cathode and anode,otherwise the controller will be broken. Please don&apos;t connect wires when power on. Please turn on again only when it is on right connection and no short circuit. Please do not use the controller in the place with widely range meal area or strong electromagnetic wave nearby,otherwise the remote distance will be seriously affected.